This article was originally published on The River of Lost Souls and is reproduced here with permission. 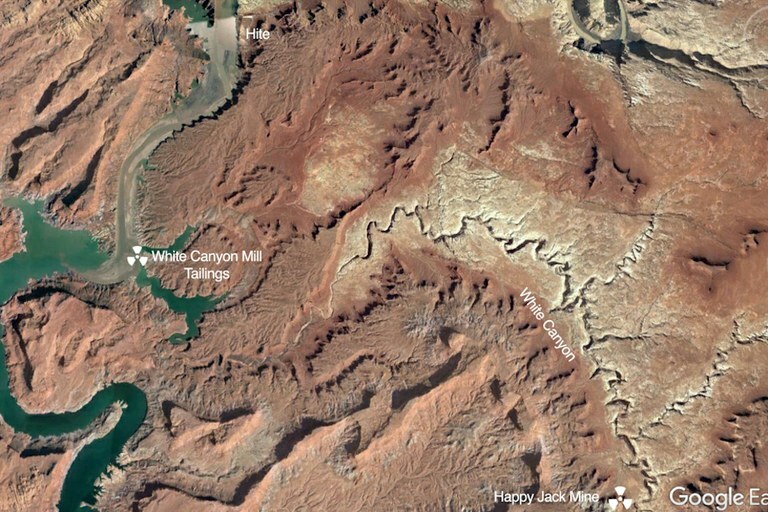 Beneath the murky green waters on the north end of Lake Powell, entombed within the tons of silt that have been carried down the Colorado River over the years, lies a 26,000-ton pile of unremediated uranium-mill tailings. 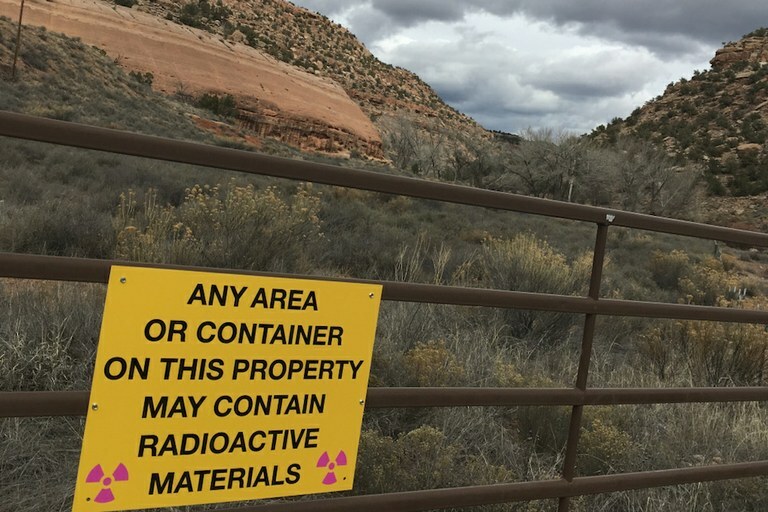 It’s just one radium-tainted reminder of the way the uranium industry, enabled by the federal government, ravaged the West and its people for decades. In 1949, the Vanadium Corporation of America built a small mill at the confluence of White Canyon and the Colorado River to process uranium ore from the nearby Happy Jack Mine, located upstream in the White Canyon drainage (and just within the Obama-drawn Bears Ears National Monument boundaries). For the next four years, the mill went through about 20 tons of ore per day, crushing and grinding it up, then treating it with sulfuric acid, tributyl phosphate and other nastiness. One ton of ore yielded about five or six pounds of uranium, meaning that each day some 39,900 pounds of tailings were piled up outside the mill on the banks of the river. In 1953 the mill was closed, and the tailings were left where they sat, uncovered, as was the practice of the day. Ten years later, water began backing up behind the newly built Glen Canyon Dam; federal officials decided to let the reservoir’s waters inundate the tailings. There they remain today. If you’re one of the millions of people downstream from Lake Powell who rely on Colorado River water and this worries you, consider this: Those 26,000 tons of tailings likely make up just a fraction of the radioactive material contained in the silt of Lake Powell and Lake Mead. During the uranium days of the West, more than a dozen mills — all with processing capacities at least ten times larger than the one at White Canyon — sat on the banks of the Colorado River and its tributaries. Mill locations included Shiprock, New Mexico, and Mexican Hat, Utah, on the San Juan River; Rifle and Grand Junction, Colorado, and Moab on the Colorado; and in Uravan, Colorado, along the San Miguel River, just above its confluence with the Dolores. They did not exactly dispose of their tailings in a responsible way. At the Durango mill the tailings were piled into a hill-sized mound just a stone’s throw from the Animas River. They weren’t covered or otherwise contained, so when it rained tailings simply washed into the river. Worse, the mill’s liquid waste stream poured directly into the river at a rate of some 340 gallons per minute, or half-a-million gallons per day. It was laced not only with highly toxic chemicals used to leach uranium from the ore and iron-aluminum sludge (a milling byproduct), but also radium-tainted ore solids. That was just from daily operations. In 1960, one of the evaporation ponds at the Shiprock mill broke, sending at least 250,000 gallons of highly acidic raffinate, containing high levels of radium and thorium, into the river. None of the relevant officials were notified and individual users continued to drink the water, put it on their crops, and give it to their sheep and cattle. It wasn’t until five days later, after hundreds of dead fish had washed up on the river’s shores for sixty miles downstream, that the public was alerted to the disaster. And so, the billions of tons of silt that has accumulated in Lake Mead and Lake Powell serve as archives of sorts. They hold the sedimental records of an era during which people, health, land, and water were all sacrificed in order to obtain the raw material for weapons that are capable of destroying all of humanity. This post was updated on 12/19/17 to correct a basic math error. Jonathan Thompson is a contributing editor at High Country News. He is the author of River of Lost Souls: The Science, Politics and Greed Behind the Gold King Mine Disaster.